I wanted to import the AirBnB calendar via ical into my Google calendar but all the blocked days were annoying. Also the end date was one day too early on all events.. So i hacked a php snippet together which filters the “Not available” events and corrects the date. Then i simply added the php URL to Google calendar and now everything works fine! If you want to use this snippet just replace the AirBnB URL with your own. If you are able to use Java 8 or up you can make use of the various methods of Random that return an IntStream. Since our range contains 100 Integers and .distinct() was used we can’t draw more than 100 numbers from the stream! 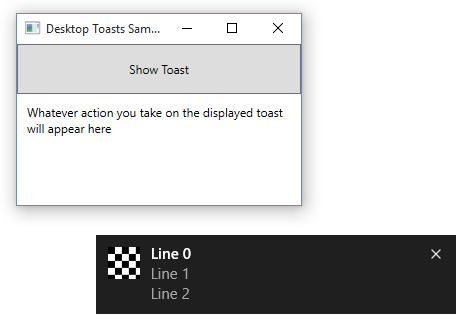 As it seems Microsoft “growls” are called toasts and i like them. I really hope that a lot desktop applications will use this new API to have a single place for all the notifications. Microsoft provides a Quickstart page with a some information and also an example for desktop applications in C++ and C#. When you want to convert a String to int or Integer you can use two simple methods from the Integer class. A common mistake Java novices do is using the == operator to compare Strings. This does almost certainly lead to unexpected and unwanted behaviour. There is a simple solution to this problem and a not so simple explanation why it is such a common mistake. The simple solution is to use String.equals instead of the == operator. it will result in a NullPointerException! This code surely could use some error handling and such, so feel free to throw your enhancements at me! It recently happened to me that I was stuck at work on a Windows installation without access to admin privileges. While I could use a bunch of portable apps I could not find a portable JDK. To get a portable JDK without admin privileges in Windows you have to follow three simple steps. Download the JDK from Oracle (e.g. JDK 8 8u111). If you want to use the x86 version simply open the .exe file with 7-Zip. It contains a single file tools.zip, which contains all the files we need. Extract the tools.zip to the desired JDK directory (e.g. “D:\JavaJDK\”).